Reach codes are similar to other local ordinances, although they do have special legal requirements as well (see here for more information). This page first lists and discusses the general steps that most local governments will follow to develop and adopt a reach code below, and then sets out a generalized timeline and provides information that local government staff should know about timing here. Ideas for reach codes can come from several places. In some cases, local governments may have clear direction from an elected body, from a General Plan policy, or from a Climate Action Plan measure. Even when a reach code idea is not clearly stated, General Plans and Climate Action Plans are good starting places to help identify what kinds of efforts will be most consistent with a jurisdiction’s goals and objectives. Cities and towns may also want to coordinate with neighboring jurisdictions’ efforts in order to provide some consistency to help with implementation and enforcement. Model ordinances, if they exist, may be another good resource. All reach codes must be shown to be cost effective. To be cost effective, the money saved from the reduced energy costs needs to be enough to cover the initial cost within a reasonable period of time. Cost effectiveness is usually demonstrated through a study prepared by a consultant. Local governments can use any study that applies to the climate zone in which the jurisdiction is located (click here to see a map of energy climate zones). All final approved cost effectiveness studies are posted on the California Energy Commission (CEC)’s website here. A cost-effectiveness study can be funded directly by a city, but most studies are developed under the auspices of the Statewide Investor Owned Utilities Codes and Standards Team (Statewide IOU Team) and funded by ratepayer funds. To request a cost effectiveness study from the Statewide IOU Team, please contact info@LocalEnergyCodes.com. If the Statewide IOU Team cannot accommodate a local government’s request, BayREN may be able to fund a cost-effectiveness study. Contact codes@bayren.org for more information. Developing a reach code ordinance will frequently involve working with the City Attorney, the Chief Building Official, the Planning Director, and other city staff who may be involved in implementing or enforcing the reach code. Providing opportunities for input from both internal and external stakeholders while developing an ordinance can help to identify and work out potential areas of conflict early, to smooth the public process. In addition, local governments can ask the California Energy Commission to review a draft ordinance and provide feedback before or at the start of the public process, so that any issues can be resolved before the ordinance is adopted. Each jurisdiction will have its own public process for a reach code. In some cases, jurisdictions may have sustainability committees or climate task forces to work with, while in other communities the City Council may wish to drive the process. What will be similar across jurisdictions is that at this point, the draft ordinance will become public, often together with a staff report. Local committees, residents, businesses, and other stakeholders will all have the opportunity to review the draft and provide comments and suggest revisions. In some cases, the draft ordinance may be revised and released for a second, or even third, round of comments, until the ordinance is ready for formal action. Since a reach code is a local ordinance, it is adopted by the City Council, Town Council, or County Board of Supervisors using the usual procedure for local ordinances. This requires public hearings, public notice in advance of the public hearings, and both a first reading of the ordinance and second reading of the ordinance at a public meeting. Some jurisdictions may include either the first reading or the second reading of the ordinance on a consent agenda. Attachment 5: Copy of cost effectiveness study used. If multiple, a brief overview of which study was used for which portion of the policy is recommended. For more information, visit the BSC website. 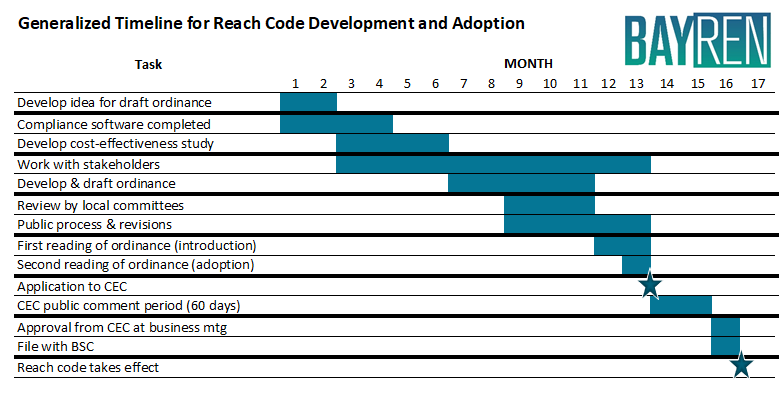 The graphic below shows a generalized timeline for development and adoption of a reach code, which is followed by information on some timing issues of which local government staff should be aware. Adopt a reach code at the time the local updated Building Code is adopted. Each jurisdiction adopts the updated California Building Code, together with any local amendments, usually late in the year before the updated code takes effect. Because a reach code is an amendment of the Building Code, it often makes sense for a jurisdiction to adopt a reach code at the same time as it adopts the Building Code.However, when they are adopted together, the Building Code and the local reach code usually will not take effect at the same time. This is because the CEC needs to approve the reach code, while no further approval is needed for the Building Code. As a result, the reach code will likely not take effect for several months after the updated Building Code has been in place. Adopt a reach code to take effect at the same time as the updated Building Code. Another option is to adopt a local reach code earlier than the rest of the Building Code, so that they can take effect at the same time. To do this, the reach code generally needs to be adopted no later than September of the year before the updated Building Code takes effect. This will allow time for the CEC to review the reach code, provide the required 60-day comment period, and hopefully approve it at their December business meeting. In most cases, local adoption of the California Building Code and any other amendments will then need to occur later in the year.This path may be particularly useful for jurisdictions that have a reach code in place that they wish to continue into the new code cycle. Adopt a reach code at some other time, when it makes sense in terms of the local process. Some jurisdictions may not have previously adopted a reach code they want to continue, and may not be ready to adopt a reach code when the updated Building Code is adopted. In this case, the best option may be to plan to adopt once the local process is complete. Suggest additional links for this page by emailing codes@bayren.org.